The Waipa District Council in New Zealand has created an interesting infographic for its citizens about the cost of having to clean up dumped rubbish. Notice that they could have spent this money, amongst other things, on 150 dog poo bins at local parks. What’s significant here is the use of the comparison. Picking up dog poo matters to most people. Be a responsible dog owner and clean up after your dog. I consider this purchase a badge of honour. Nappy bags (diaper bags for those of you who live in the USA/Canada) are an excellent tool for picking up dog poo. I just got 100 bags for only $2.15 (a much better price than purchasing special doggy doo bags from the pet store). Sadly, I think I am in the minority when it comes to dog owners. Or, at least that’s the way I feel. Today, I took Izzy for a walk in a local park after going to the supermarket and I counted 4 piles of poo that owners had not picked up. One of them was in a field used for cricket on the weekends. It’s a sign that we have too many irresponsible dog owners in Christchurch. And in today’s paper – Mike Yardley – a local commentator, agrees. He laments the pitiful rate of enforcement by our Council and calls upon members of the public to name and shame. If you see a dog owner blithely pretend their animal hasn’t just crapped all over the footpath – have a crack at them. Shame them into behaviour change, because the council probably won’t police it. That’s fine – to a point. When you feel safe to do so. But we also need greater enforcement so people take dog-owning responsibilities seriously. And we shouldn’t let the Council, which uses our taxes (rates and dog registration fees) to fund its activities, off the hook when it comes to its responsibility. The title of this post is unashamedly taken from an article in the journal Environmental Sociology. This article is a study, primarily focused on European nations, and the patterns of owners who do/do not clean up after their dog poops. The author observed that people are more likely to clean up after their dog when there are people around to watch. This exploratory study thus suggests that observing activities and strategies of defecating may provide new insight into human–animal relationships by exploring the role of droppings. An important prerequisite for successfully displaying poop and for diverting attention away from the fact that dog poop is increasingly to be seen in public is that the actors involved are skillful enough to attest to nonknowledge about the production of excrements by their best friends. That’s the opening line of a current Kickstarter campaign to obtain funding for Poopins, a biodegradable marker for piles of dog poo that haven’t been removed by unthinking dog walkers. 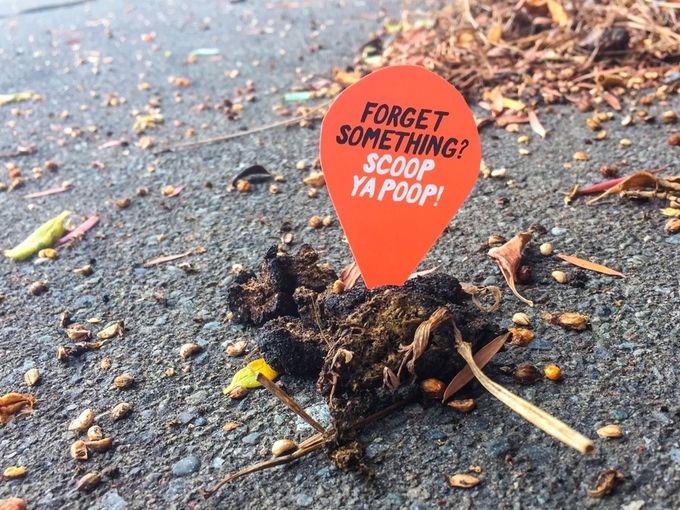 Motivated by walks on Sumner Beach here in Christchurch, where numerous piles of dog poo have been observed, local man Stephen McCarthy came up with the idea of Poopins (think ‘poo’ and ‘pins’ combined). I’m not sure if this product will ultimately get funded. But, the fact that someone is thinking of this type of open reminder to dog owners, points to the fact that we have too many irresponsible dog owners in this city. Picking up your dog’s feces should be non-negotiable. Today, as part of my weekly shopping, I bought a package of nappy bags (diaper bags for Northern Hemisphere readers) for picking up poop. Bags are probably the easiest thing to get hold of; I re-use bags when I have them available, and then the nappy bags the rest of the time. I personally would like to see the City of Christchurch become more dog-friendly with urban design that makes responsible dog ownership the norm – and apply peer pressure to those dog owners who are not responsible. When dog owners don’t clean up, they make it harder for the rest of us to enjoy our dogs openly and with a variety of locations to choose from. Please – no matter where you live in this world – clean up after your dog. It’s the responsible thing to do! It’s National Scoop the Poop week in the USA. In 1991, the EPA declared dog poo a non-point source pollutant. Other non-point sources include herbicides, oil and chemicals (including those used for production agriculture, or in your own back yard). 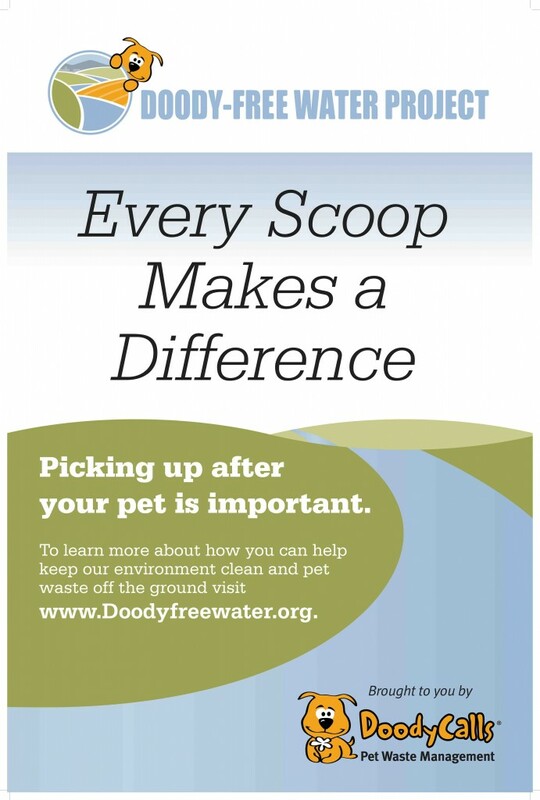 To get into the spirit of things, the DoodyFree Water Project is giving away 250,000 pet waste bags to dog parks and other green spaces. You can apply through their website by explaining how a bag donation will impact on your community. You can also read about DoodyFree projects in your state. The DoodyFree Water Project is sponsored by waste management company DoodyCalls.